Matryoshka Korobeynik with 6 Figurines "The Birth of Jesus Christ", 8"
Matryoshka Korobeynik is very special and different from classical matryoshka. It does not include identically shaped dolls which are stacked together and vary in size. Instead, you can find several little figurines of different characters of folklore tales or fairy tales. Each individual little figurine is handpainted so that every design is unique. 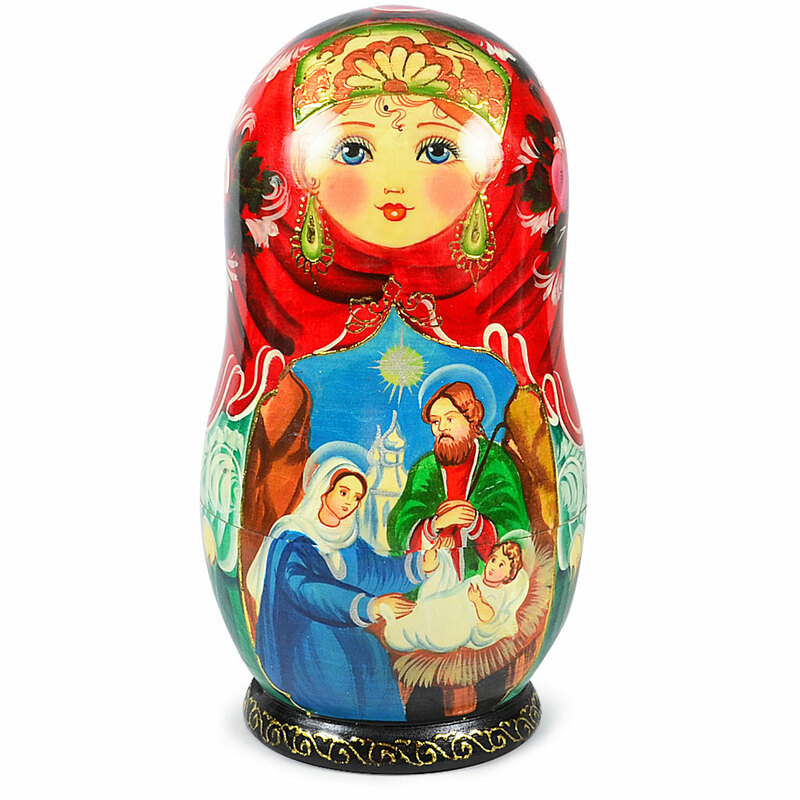 This matryoshka was handmade and hand painted, so it has a unique and exclusive design. It was crafted using the best paints and lacquer, and with powder of real gold and silver. It includes 6 little figurines which all can be used as Christmas tree decorations. 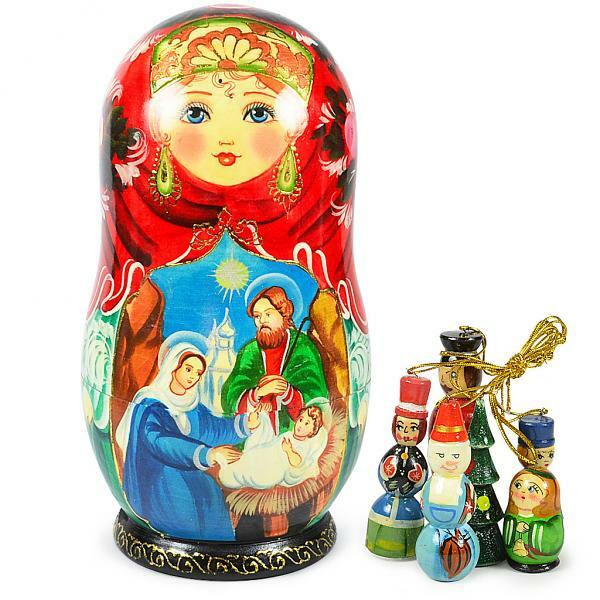 This original matryoshka will also be a great present for your friends and relatives as a representation of the rich and diverse Russian culture. Matryoshka Korobeynik "Snowman" with 6 Figurines (New Year Tree Ornaments), 8"
Exclusive Handmade and Hand Painted Boyarinya Matryoshka Korobeynik, 7 pcs, 8.5"
Matryoshka Snowman Nesting Doll "Korobeynik" with 5 Ornaments, 4.5"
Handmade Father Frost Nesting Doll (Blue), 5 dolls, 2"
Matryoshka Snowman Nesting Doll "Korobeynik" with 5 Ornaments, 6.5"
Santa Claus/Father Frost Nesting Doll Russian Traditional Matryoshka, 3 pcs, 3.5"
Jolly Santa Clauses Handmade Wooden Christmas Ornaments, 6 pcs, 2"
Snowman Nesting Doll Matryoshka Korobeynik with 5 Figurines, 4.5"